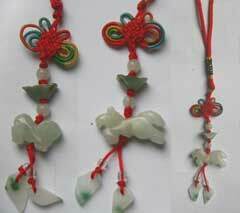 Home » Products » 2012 Cures & Enhancers » Wealth protection trinity talisman (San Bao – three jewels). The Wealth protection trinity talisman is a very unique enhancer and protector for wealth with three auspicious Chinese i-ching coins that have all been chosen from a good dynasty (very important) tied together with red ribbon to form a triangle which is the strongest of all the geometric shapes. 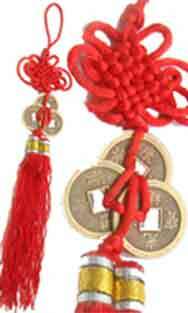 The three Chinese i-ching coins represent a trinity of prosperity enhancement (San He) and the top is tied with a lucky knot and combined with double tassels at the bottom to make this a very commanding cure and enhancer in 2019 and must be placed in the northwest of your home or your office/study. 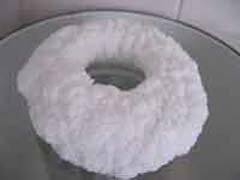 You can also place them in your purse/wallet, handbag, account books, till, cash tins etc to attract wealth and abundance. 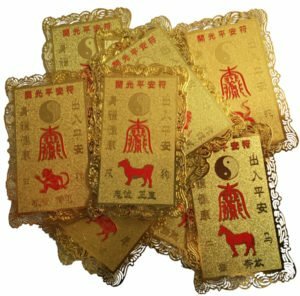 Where do I place the Wealth protection trinity talisman in 2019? 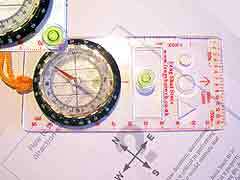 The Wealth protection trinity talisman should be placed in the northwest of your home or office or northwest area of an important room. How do I display the Wealth protection trinity talisman? When should I display the Wealth protection trinity talisman? 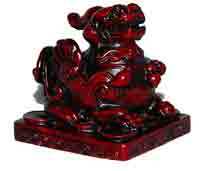 1 review for Wealth protection trinity talisman (San Bao – three jewels). Please explain how or if this cure is used in 2015 as on gao qian Three i-ching coins with mystic knot and tassel description it says that "you must not use the trinity three coins that are formed into a triangle as this can cause wealth problems."